Make 2018 "The Year Of The Jackal"
I am extremely excited about the message tonight because the message is focused on life, your life, the breath that you take each and every day. Those elements essential to you and I being able to wake up each and every morning. It’s vital to understand that special experience one has when he/she opens their eyes and ears to a brand new day. 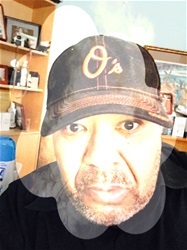 You see maybe not everyone who read yesterday’s message about how words yours and others can be detrimental to the pathway of success woke up this morning to read today’s message focused on the vitality of life. The story I am going to relay to those reading my blog this New Year Eve involves 2 key characters that live in jungles of our mother continent, Africa. One is the KING OF BEAST, the greatest of all the beast of the continent the mighty fearless lion. The lion who strolls with a purpose in each and every step knowing full well no animal dare threatens his existence. The mighty lion who takes care of his pride the lionesses and the cubs fully aware that he, only he, is the KING OF ALL BEAST. I am going to change up this story just a little in the selection of the second character rather than just a dog, I am going to make this character the wily, intelligent jackal. The jackal who lives in the same jungle as the mighty lion but resides on the outskirts of existence. THE JACKAL doesn’t threaten the lion in any way. Heck, even a growing lion cub may strike fear into the jackal especially if the MIGHTY LION is covering that lion cub’s back. The jackal lives on the scraps of the kill while the mighty lion eats the full range of choice cuts. No animal steps to the mighty lion without expecting severe repercussions. Even an entire pack of jackals won’t engage in battle with the mighty lion without the utilization of some trickery. You, in the mind of both the LION and the JACKAL the LION is invincible, indestructible and without rival. Yet, in one instance that MIGHTY LION is no match for the lowly, wily JACKAL when is that situation, you ask? Quite simple, when the MIGHTY LION has taken his final breathe when he has strolled his final stroll and intimidated his last prey. It is then that the lowly JACKAL has his way with the MIGHTY LION. The jackal a single jackal can step all over that once, mighty, seemingly invincible lion. The lion, that specific lion no longer carry with him the ability to strike fear into animals he comes upon. You see the MIGHTY LION has died. No matter how large the accomplishments, no matter how high the number of conquests, no matter who that MIGHTY LION stepped over to get to his position of power. It is at this moment that the MIGHTY LION wished he was that lowly jackal. You see that lowly jackal who once struck absolutely no fear in the mighty lion has something that the MIGHTY LION no longer has the ability to make a difference. The jackal can change his/her circumstances why he/she may never be that MIGHTY LION he/she can make a difference. That lowly jackal who was deemed lower than low yesterday to that mighty lion has now the ability to step over and surpass that now dead lion. Hence, the saying which I will change because of author’s choice A LIVE JACKAL IS BETTER THAN A DEAD LION. You can turn that to your own human condition. You may say that I have never been successful in my endeavors. I have never been able to carry on a conversation with that lady who you have avoided eye contact with for fear of rejection. I can never take hold of my own finances and build an independent life fully enriched with earnings that you ear in your own business. I can never finish school and get that degree because someone told me that I didn’t have the skills necessary to succeed in school. You are nothing more than a jackal facing up against a nation full of lions. Yet, guess what take a trip with me to the richest neighborhoods in this country. In those specific areas, they have a place that is full of lions that you can step on, over, and through. The cemetery where the dead human lions are buried. You think that Steve Jobs, wouldn’t trade places with you today if given a chance, he of the APPLE fame and fortune? He was a MIGHTY LION but I am sure he’d be quite happy to have another day of life as a lowly jackal. You know why because what comes with that day as a jackal is the ability to become a MIGHTY LION once again, or even better JACKAL. So when you think that all is lost and you have lost what little faith and self-belief that you own. Know this that as long as you breathe the air in this world. You are as mighty as any dead lion, and any dead captain of industry. You see with life comes the ability to change your circumstances. 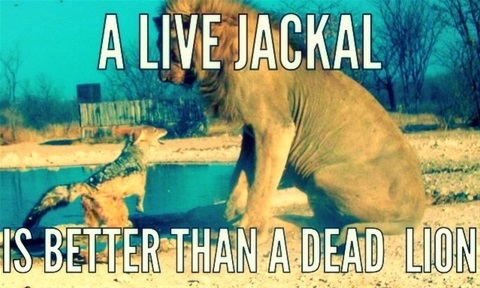 Any day of the week, any month of the year, no matter what anyone says that live jackal is better than any dead lion. So relish in the fact that you are alive and with that fact even though you may not believe it. You can become more than you are at this particular moment. You can definitely achieve more than any dead, buried lion. I can only hope this story renewed you just a bit if you needed it.